What happens when Mommy gets all of her chunky little baby’s sugars? 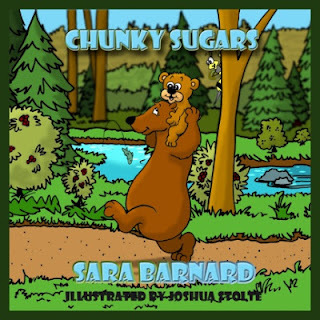 Find out in Chunky Sugars, an endearing picture book written by Sara Barnard and illustrated by Joshua Stolte. Sara Barnard, author of the historical fiction series, An Everlasting Heart, has been reading children’s books her whole life. First, she read them as a child then she read them to her four beautiful children! Sara has her Bachelor’s degree in history, has had her work included in numerous anthologies, and has written several other books to date. Sara and her family make their home in the historic hills of Oklahoma along with their three dogs, three cats, and eight chickens. Sara's Blog about life as a Mommy of four and wife to a Drill Sergeant.